The Forum wishes to make it clear that this piece represents the personal view of Simon Briscoe and does not represent the view of the Forum as a whole. 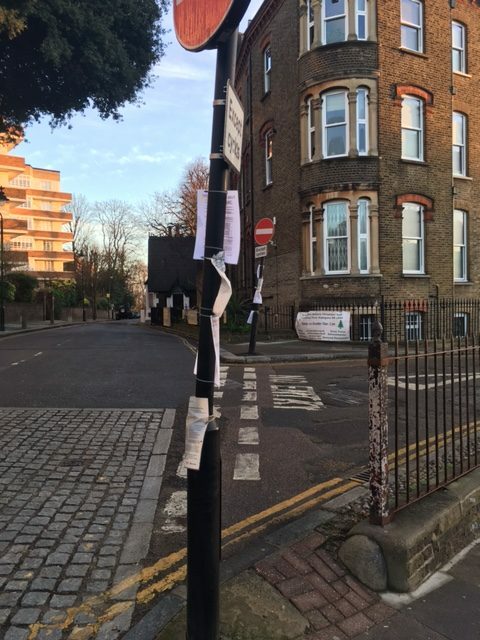 The more observant residents of the area around Highgate Hill will have noticed signs on lamp posts that set out Haringey’s plan for The Bank. The statutory notification is here and here. Some of those living on The Bank broadly support the changes as it removes parking and improves the immediate surrounds to their properties but there are other issues to consider: parking, road maintenance and transparency. Parking. Ten or so parking spaces will be lost – on top of others, this means about 20 CPZ (resident and business) spaces will have disappeared in the last couple of years in little more than 100m stretch of road. We learnt in November of more going in Cholmeley Park. Those that remain on The Bank will be narrower thereby limiting which cars can use them. This loss of parking cannot be afforded in an area of parking stress that is about to suffer further from changes in Islington’s CPZ rules. The change will clearly have implications for resident/business car owners, residents’ visitors, deliveries and those wanting to use the facilities of the High Street or visit Lauderdale House or Waterlow Park.Added on 1 March, 2017: The Forum has now met Haringey and Camden officials and Haringey will shortly consult on some additional parking spaces to replace those lost on the Bank. These should come into use at the same time as others are removed from the Bank. Transparency. There is a key point of principle here. Like the plans or not, I feel that there has been insufficient transparency about what is driving the Council’s actions. Such a large removal of parking is not justified by the engineering reports that are publicly available. On issues like this, I expect the Council to act on the basis of evidence accessible to the public. Requests to see reports and other papers linked to decision-making have been refused when requested under FoI. Incidentally, the Council was a few days late putting proposed TMOs on line (and then back-dated the entry). Haringey is also planning to introduce a 7.5t weight limit on The Bank. This is a step in the right direction but as virtually all the heavy lorries using The Bank are for deliveries – and deliveries are excluded from the ban – it is a token. Heavy lorries coming to the school (both ways up a one-way street) will still stress a highway ill-equipped to take such weights. 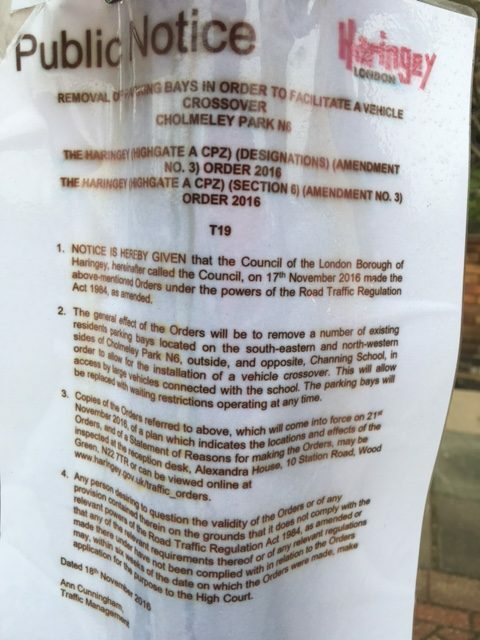 (Channing has agreed to have deliveries by its entrance on Cholmeley Park.) We need a full ban, enforced by removable bollards, if The Bank is to be protected and the full amenity benefits are to be delivered. The southbound cycle lane will also be removed. Please respond to: Haringey (traffic.orders@haringey.gov.uk) and add your comments to this blog. I whole heartedly support this blogs view. The Bank should be repaired and a vehicle weight limit applied ot stop further damage in the future. Any closure to parking slots on the Bank should be temporary while repair works are underway, with parking being reinstated afterwards. Channing School is committed to working with the residents of the Bank and the Local Authority to try and find the most sensible short and long term solution for the Bank and will continue to do so in a positive manner. As a local neighbourhood amenity, educating the daughters of many local residents pupils, the school fully understands local pressures. In order to operate safely and effectively as a school we have to ensure that suitable access is maintained so that the school’s buildings and facilities some of which are over 200 years old can be maintained. The school has enjoyed access from the Bank since 1885 in order to do this and hopes to continue to do so. It is not only those who live on The Bank who support the changes; it is also local residents, and people who walk, who would prefer a road, attractively planted with trees and shrubs and with no parking. Not only would it improve the prospect of this historic approach to Highgate, but, with careful planting, could mitigate the effects of the dreadful pollution we suffer on Highgate Hill. In fact, many of us would rather take the imaginative leap of closing the road once more and making it access only. The retention of four parking spaces was a concession. As for the parking, at night there are only about 7 cars on The Bank and there are a good 12 spaces on Highgate Hill below. The obvious solution would be to extend the hours of the CPZ. Highgate has good public transport links and we should be discouraging the use of cars where possible. As for repairs, the fact remains that The Bank, is a fragile structure and having been built around 200 years ago, is not fit for carrying modern traffic or any significant weight even though it was reinforced some years ago. When the railings are hit, the wall deteriorates, so keeping traffic to a minimum and keeping it away from the railings is just common sense. The engineering reports totally support the removal of parking, in order to move traffic away from the railings. My own feeling is, that the engineering reports could be used to close the road altogether and have no parking. While I agree with Simon that Haringey have been dilatory over the past 6 years when I have been trying to develop a plan to make The Bank a shared space for pedestrians and cyclists, the fact remains that they have had several meetings in the past year with people who are interested and while he feels his views have not been taken seriously, I feel the same. The result is what is called a compromise, and without compromise, Haringey will continue to delay and procrastinate as they have over the past years.